One of the places mythology attached is definitely Trojan. Since Homer wrote the Iliad, the city became part of the most epic of our culture. We all know the stories of Achilles, Ulises, Helen of Troy and the horse he deceived the inhabitants of the city. At the end of the peninsula of Anatolia, near the entrance to the Dardanelles Strait, We can visit the ruins of the city founded ago 5000 years and now attract thousands of visitors who come to tread the same places where they were heroes. When asked about the ruins of Troy usually tell us that little remains of the city and do not expect to find anything that reminds us the stories we know. However, at the entrance stumbled playback mythical wooden horse that we have so often seen in books and movies. When we contemplate it and the surrounding area from height, our imagination begins to work and complete what our eyes see in the few remains can be visited today. In fact, excavations have found 10 Troyas. The city was in a must pass between the Aegean and the Black Sea and its bay was the place where ships taking shelter from strong currents Strait awaiting favorable winds. This Trojan always made a very prosperous city, Product trade and fertile land surrounding it. But it also aroused the greed of their neighbors and Troy was attacked and destroyed again and again over the centuries. When we visited this during our visit, we approach the edge of town and we always do the same question. Where is the sea? Because from what were the city walls just the entrance to the Dardanelles in sight at the end of a plain full of crops. The explanation is the same as in many other places, rivers for centuries have deposited sediments in the bay to cover completely. In Troy were the Scamander and bring those responsible Simoeis coastline almost five miles from where the port was. Although all, is still possible to see the remains of the legendary walls of Troy, including the main entrance to the city where Paris left never to return path of his confrontation with Achilles. After successive destruction, City got up again and today the remains of the different layers Troys are located one above the other. 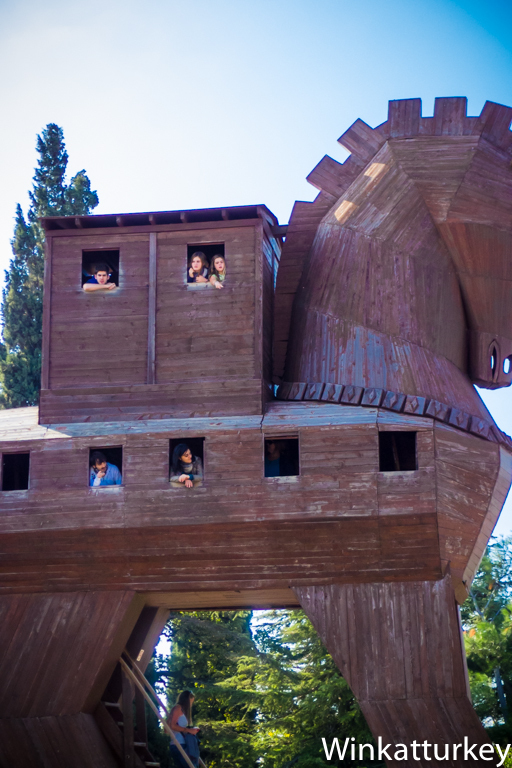 Historians have found that the trojan number 7 was destroyed by battle and at least two other Troys were destroyed by earthquakes. This makes the view a continuous time travel, we are so soon to a wall three thousand years ago, as we walk along the causeway that Alexander the Great visited or seven hundred years later we see the remains of a Roman Odeon of. The result is a very special visit. If we approach Canakale, also visit the peninsula Gallipoli, Look out over the Straits of the Dardanelles, savor the excellent olive oil and try the popular local sweet called “peynir helvasi”, should not fail to visit the remains of Troy.